0 Comments Published by KL Ocs Kid on Wednesday, June 20, 2007 at 3:45 PM. Alan Shearer has warned Newcastle boss Sam Allardyce not to bring Craig Bellamy back to his former club. Allardyce has been linked with a move for Liverpool's 27-year-old striker, who left St James' Park two years ago. 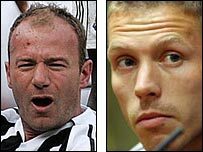 Bellamy had bust-ups with then boss Graeme Souness and also allegedly criticised Newcastle legend Shearer. Shearer said: "Has no-one learned their lesson about signing him? If only Rafa Benitez had rung me I would have told him exactly what he was like." Shearer added: "I was having a few days away in France with my former Newcastle team-mates Gary Speed and Steve Harper and the wives and I picked up the newspaper. I was having a fantastic day. "But when I read Bellamy for Newcastle I thought I would definitely have to have another drink. I had several. I hope there's nothing in it." Bellamy also had a tunnel bust-up with Newcastle coach Terry McDermott after Liverpool's 2-0 win at Anfield last season. Shearer said: "It would be interesting, especially with Terry McDermott still at the club. There was a scuffle at Anfield when Craig and Terry were coming down the tunnel."